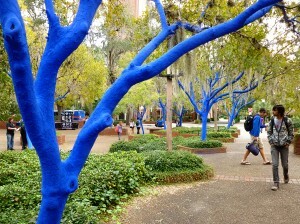 One of the coolest public art projects I’ve seen in a while is going on right now at the University of Florida campus. Last year UF Fine Arts decided to start celebrate each October even bigger and better than before since it is National Arts and Humanities month. You might have noticed the Seward Johnson statues all over town and one especially monumental one on the Plaza of the Americas. 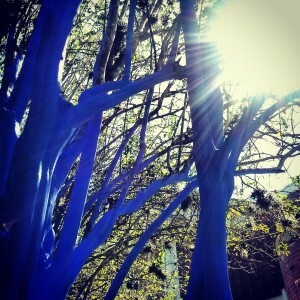 This year the showcase art project of Arts and Humanities month is called The Blue Trees. 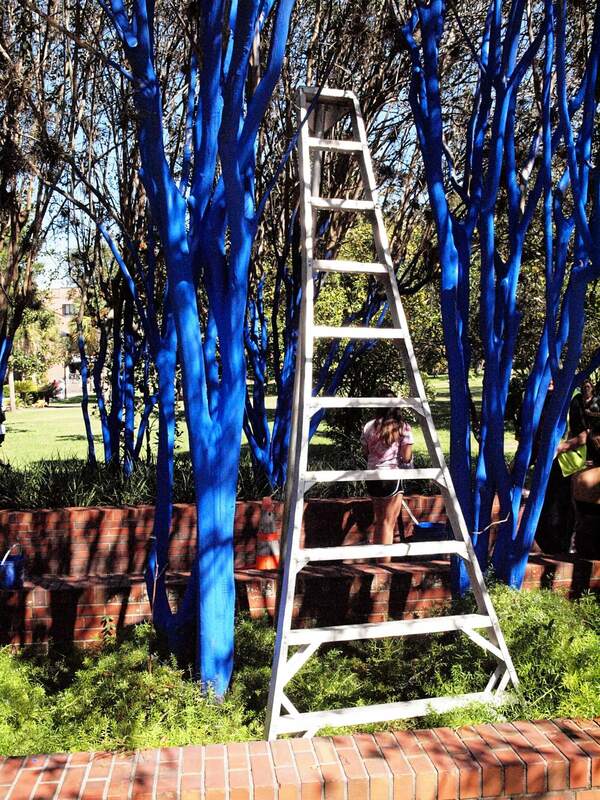 Australian artist, Konstantin Dimopoulis colors tree trunks blue in order to make them more prominent pieces of the environment. 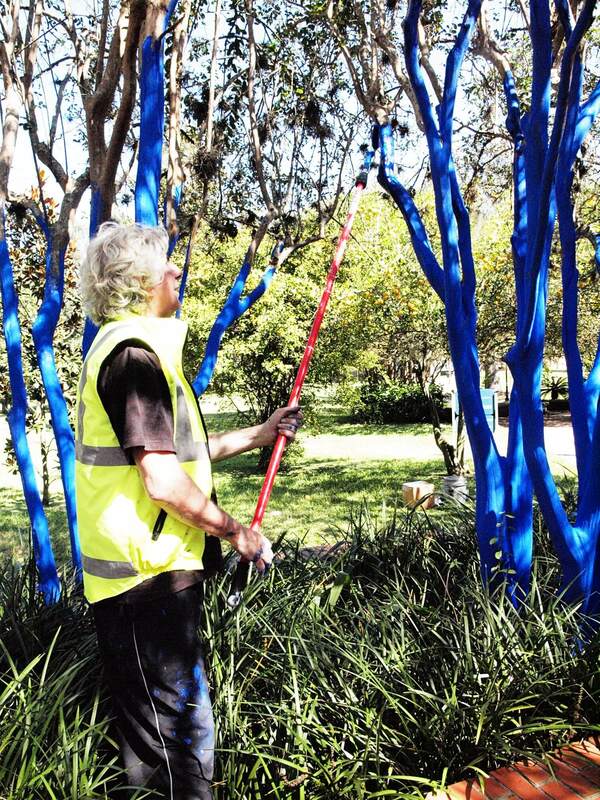 He believes that people stop noticing trees and nature in their surrounding over time and by making the trees stand out again people will be more aware of the trees around them. He also hopes that the public will be more informed about deforestation and how important it is to take care of everything around us. 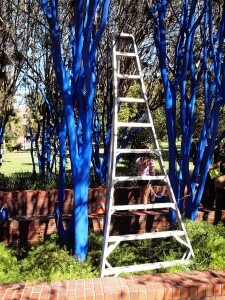 Last week the artist and some volunteers began coloring the trees a bright ultramarine blue in several groups on campus. 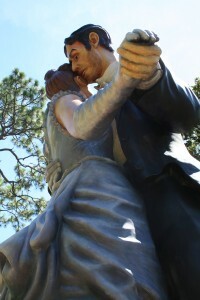 One is right outside the Reitz Union and another is in front of Turlington Hall. The water based colorant that is applied to the trees is totally safe and won’t harm them. It will also be really cool to see what happens over the next several months since the color is supposed to naturally wear off in 6 to 12 months, depending on the weather and sun. Almost done getting to the tops of the trees. Make sure you keep an eye out for the Blue Trees next time you are on campus! There are three groups of trees: near the Reitz Union, on Turlington Plaza and in front of the Harn Museum of Art. They make for especially great photos since they are ‘Florida’ blue. 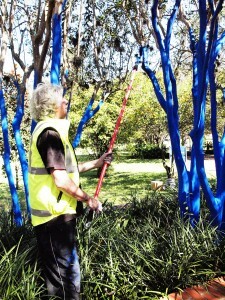 Wow,would love to help push forwared the cause.What exact paint is being applied to the trees . . .? Can paint be purchased from Lowe or Home Depot . . .?